After months of hype and reportedly millions of pre-orders, the security-focused Blackphone started shipping to early pre-order customers on Monday.The Android-based smartphone comes packed with apps for encrypted voice, video, and text messaging, as well as more control over the onboard information third-party apps can access. While pre-order phones are shipping now, new customers will be able to pony up $629 for their own Blackphone starting Wednesday, July 14 on the Blackphone website's store. A co-creation of Silent Circle and Geeksphone, the Blackphone is a 4.7-inch handset running a security hardened version of Android 4.4 (KitKat) dubbed PrivatOS. Secure messaging is handled by Silent Circle's suite of Android apps, but complete encryption only happens when you are communicating with either another Blackphone user or someone using the Silent Circle apps. 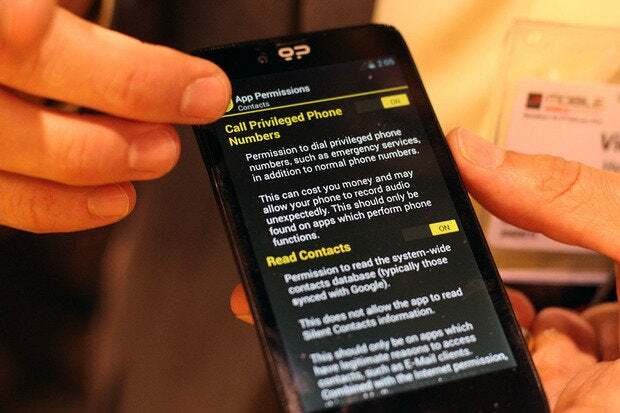 The Blackphone also gives users full control over whether third-party apps can access data such as your address book, location, and photo gallery. The only problem, as we noted in March, is that sometimes denying an app access to information means the app will crash and fail to work properly. At the time, the companies said they were working on a fix for the issue. Beyond apps and messaging, Blackphone ships with anonymous web browsing, built-in virtual private network access, and remote wipe tools, as well as SpiderOak's encrypted cloud storage. The Blackphone also prevents Wi-Fi hotspots from grabbing wireless location history, which could be used to track a users' location history or travel patterns. The phone itself is a pretty nice looking device, with a 720p IPS display, a 2GHz quad-core Nvidia Tegra 4i SoC, 1GB RAM, 16GB of onboard storage, a microSD slot supporting up to 128GB of additional storage, an 8 megapixel rear-facing camera, and a 5MP front-facing shooter. For connectivity you get Bluetooth 4.0, Wi-Fi, and LTE. The Blackphone is one of several major security projects involving Silent Circle. The company is also working with Ladar Levison, creator of Lavabit encrypted email, to create Dark Mail, an email standard that secures message contents as well as metadata. This story, "Security-focused Blackphone ships, stuffed with encryption and anonymity tools" was originally published by Greenbot.